Most of the world's best golfers will take this week off after The Players Championship, but there are still some very nice anchors for your DraftKings lineups at the AT&T Byron Nelson. Dustin Johnson, Sergio Garcia, Jason Day, and Jordan Spieth headline the event; after that, it's a pretty big drop off. That means you'll need to find some diamonds in the rough to round out your lineup. This will be the last season the Byron Nelson is played at TPC Four Seasons as next season it begins its new home at Trinity Forest Golf Club. Four Seasons plays as a Par 70 and will play close to 7,200 yards. The winner in the last three years has averaged close to 16 under par, so four rounds of 66 will likely get it done. With only two Par 5s in play this week, Par 4 Scoring and Par 3 Scoring get a boost in the key stat department. Could this finally be the year Spieth takes down his hometown tournament? Spieth accepted invitations to play as an amateur in the Byron Nelson in 2010 and 2011 and finished a respectable 16th and 32nd. The 16th-place finish in 2010 remains his top finish in the event. After missing two of his last three cuts — including the Players last week — he will look to rebound in his home town. All of the big names in the event are pretty equal this week in the stat category so we took it a step farther and looked for players who can putt from 15-25'. Spieth ranks 22nd on tour in that range and was 10th before struggling with the new greens at the Players. Backing up his putting, Spieth ranks 2nd in BA and BoB% and he comes in 6th in Par 4 Scoring. Coming off missed cuts in two of his last three events, we may get Spieth at reduced ownership this week, which makes him a great play in GPPs. Being that we rate players higher on stats than most sites, this play may seem mind boggling. 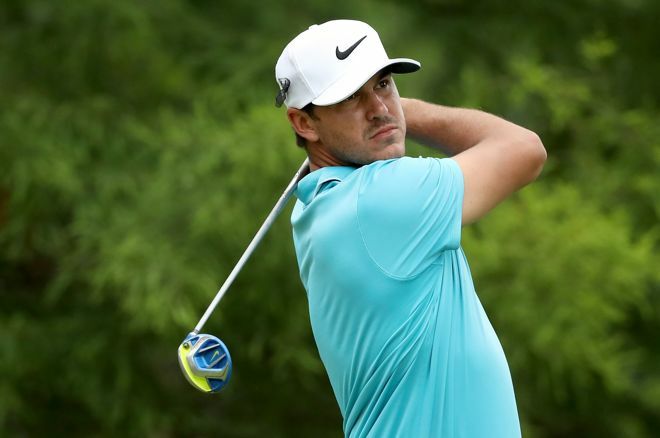 Koepka ranks 163rd or worse in five of our key stats this season. That seemed really odd for a player who finished 16th at The Players, 11th at The Masters, and runner-up at The Valero. He has been putting really well this year, so if Brooks can improve his ball striking this week he could find himself in contention on Sunday. He also seems to love this course; after missing the cut in his first time playing the event, he posted a 16th in 2015 followed by a runner-up last season. Henley's price only climbed $100 since last week despite coming into a much weaker event. After finishing 35th at The Players he is still in great form following a win and an 11th in his last four events. He did miss the cut last year at the Byron Nelson but finished 22nd in his first year playing the event. Henley gets it done in most of our key stats, ranking 13th in BA, 24th in BoB%, 13th in Par 4 Scoring, and 14th in Par 3 Scoring. If there was a course made to fit Henley's game, it would be this one. Henley also ranks 8th in putting 15-25' and 2nd in Round 1 Scoring. Huh comes into The Byron Nelson after missing two of last three cuts. He also missed the cut in this event last season. He does, however, hit many of our key stats this week. Huh ranks 12th in BA, 22nd in Par 4 Scoring, 4th in Scrambling and 27th in 1st Round Scoring. He has had success in Texas and will be looking for his second top 10 of the season. At this generous price, he should make his way into your lineup.